In the last few weeks I took part in two brilliant conferences in Ireland and Germany. 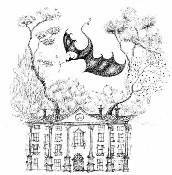 Tolkien: The Forest and the City was held at the School of English at Trinity College Dublin, on 21st-22nd September 2012. I presented a paper alongside an impressive array of Tolkien scholars including Tom Shippey, Michael Drout and Thomas Honegger. My paper was entitled: “‘Wildman of the Woods’: Inscribing Tragedy on the Landscape of Middle-earth in The Children of Hurin” and explored ideas of the city vs. the wilderness in Turin’s movements on the map of Beleriand and the way his tragic story re-enacts Oedipus’ similar route and fate. 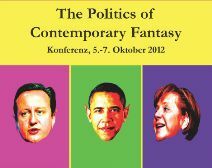 Between 5th and 7th October I was in Wurzburg, Germany to give a keynote lecture for The Politics of Contemporary Fantasy conference held at the University of Wurzburg. My lecture was on “Revisiting Race in Tolkien’s Legendarium: Constructing Cultures and Ideologies in an Imaginary World”, in which I explored Tolkien’s hierarchical secondary world and the materiality of his invented cultures. Most of the conference papers focused on contemporary fantasy and there were some excellent discussions and debates that developed during sessions. I also enjoyed the second keynote lecture by Farah Mendlesohn on “Post-Colonialism, Post-Second-World-War Fantasy and the Construction of Childhood”. There was a report on the conference on German radio (Deutschlandfunk: “Der Zauber magischer Welten”) for which I gave a short interview. You can hear to this short programme (in German – my contribution is dubbed, but you can hear me in the background!) via this link. Meanwhile, on Bilbo and Frodo Baggins’ birthday (22nd of September) I contributed a reading of a short extract from The Hobbit for Middle-earth Network’s Hobbit Day 2012. I chose the second part of Chapter 3 (‘A Short Rest’) which includes a description of Elrond and the discovery of the moon-letters on Thorin’s map. My reading was broadcast online as part of a series of readings by a number of Tolkien scholars, artists and fans, including Colin Duriez, Ted Nasmith, Tom Shippey, Verlyn Flieger and many others.